Ok this is a big title and I doubt this first post will make it definitive, I'm hoping others can come and add to this to make it "definitive" but because there is a weekly post from peeps asking how do I plug this or that in maybe this can be where most of the answers can be found. You can see here how there is -12v on the bottom two pins, 3 ground pairs of pins and the +12v pair of pins. This is the configuration for 95% of modules with the other 5% using the remaining pairs for bus access for gate and CV and an extra 5v for those modules that need extra juice. Please read the Doepfer Technical pages for further info. The above image is the same for the modules and the standard bus access boards in most modular cases. Please note that I will use "most" quite a bit as some manufacturers have strayed from this "standard", but hopefully from the info here you can work out any abnormality. 1. The first step you must make is identify what the configuration is for the bus boards in your modular case. Mostly the main manufacturers will follow the Doepfer standard having -12v on the bottom, but take a minute and check. 2. Second step is to identify on your module where -12v is on the PCB. This will usually be marked with -12v, "red stripe" or some other variation. If there is nothing there maybe post a question in this thread and someone will answer. 3. Third on the surface seems simple- match the bus boards to the module using the ribbon cable. In my experience this is where the big mistakes happen. Ribbon cables are not always built to a standard even though they are meant to be. You must always check the cables before connecting anything. Go and grab a ribbon cable, have a close look at the header component. You should see a small triangle marked on one side. Now in an ideal world all the cables you have should have the red band of the cable matched up to this triangle, as this is the correct way to build them- using the red band and triangles as -12v, meaning when plugged into a bus board with keyed headers (black plastic things, not just pins like on the doepfer bus boards) the power is correctly aligned. 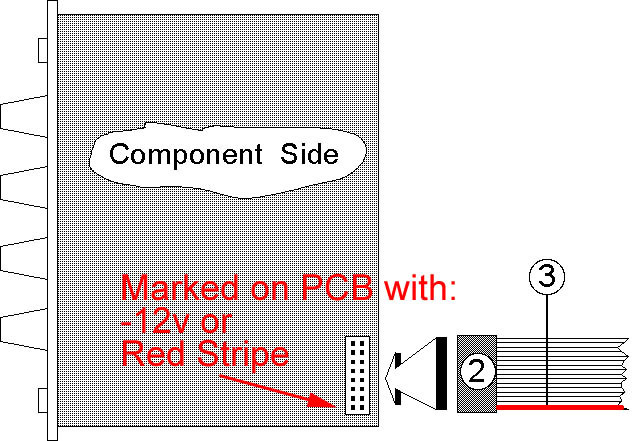 So when a module has "red stripe" on the PCB it is assumed that it is referencing the -12v. The only modules I haven't had experience with are Cwejman, and I know there is something funny with those, so if someone can chime in, but by following this procedure for every module I've bought either new or second-hand I've never fried a module (fingers crossed). I'll try and add some more pics to this, espeically of the cables, plus I'll show you an easy way to reclaim a improperly built ribbon cable. But this should get you a little further to sonic joy. All the rest are 0V although I didn't bother to find out which ones are actually tied to ground. It could be that some are floating. So, for the sake of ease: "The upper most pin is your -12VDC". This is where the red stripe of your ribbon should go for the Doepfer standard. This is the exact opposite of what was chosen for the Analogue Systems standard. Their red strip goes to 0V. This thread has now been 'Stickied For Reference'. It may only be temporary depending upon many factors. This matter is an important one but may be left to entropy in the future. You can see here how there is -12v on the bottom two pins, 3 ground pairs of pins and the +12v pair of pins. That's the orientation that Metasonix uses. The "red stripe" doesn't matter, because those header plugs that Doepfer uses have no polarity. I once asked Dieter why he didn't use Molex power connectors that had keying--he said "the headers are cheaper". In a happy world, the modules would have connectors attached permanently to the PCB, and the connector would always be polarized so they could not be connected incorrectly. Euro became the dominant format for one major reason: cheaper. This question has been posed many times here on Muff's. It's definitely a head-scratcher to be sure. It costs next to nothing to do so which is very much unlike the cost associated with sending blown modules back and forth and some poor guy's time in repairing them. I think that STG Soundlabs is putting them in as standard. I remember a thread in which that was mentioned but I can't find it. I don't know about anybody else, but I started putting them in stuff I make right from the beginning just because it seemed so easy to hook modules up backwards. OK, forgive me if this is a dumb question: Just bought an Analogue Solutions module, LFO-NZ. On this module, the red stripe is clearly connected to the side on the PCB that says "stripe". So far so good. My MW busboards have keyed headers, i e cables can only be inserted one way. Now the possibly dumb question: as I have clearly identified the red stripe being connected to the module's negative, which happens to be UP on the module, and I know that the bus board negative is DOWN, is it still wrong to twist the cable? That way the red stripe would be facing the negative in both ends. Physically twisting the cable doesn't matter as long as it's not electrically "twisted". ...meaning if you've got the red stripe on the negative side of the connector on the module, and at the other end have the red stripe on the negative side of the bus-board connector, you're good to go. You've got negative hooked to negative. Physically the connectors might be any orientation depending on what the module designer was feeling like (negative up, negative down, negative right, etc.). Thanks for the advice. Nothing burned. so, the red stripe goes up then. glad they are protected. Is there are drawing somewhere which shows the configuration of the Analogue Systems power/bus connector? The video below gives some hints, but nothing exact. Is there a source that can make a power cable adapter with an Analogue Systems connector on one end to a Doepfer connector on the other end. I have an old AS rack that has space for some Doepfer modules but the power connectors of course are completely different even though the voltages are the same. I put yesterday the first modules in place on a Doepfer rack, I followed your advice of matching the triangle (-12) to the -12 and all is fine! Regarding Cwejman: I've connected a MMF-1 with the red stripe down in a Doepfer case (there's only way to connect the cable to the module). According to the PDF attached above this is wrong.. but the thing is it was working just fine. So I checked the cable and found that the triangle is on the red side on one end and on the other it is not. So have I unknowingly made the right connection after all by connecting red down because the cable is 'wrong'? the red stripe on Cwejman modules is marking +12v. So it is up when plugged into a bus board. The first post in this thread explains what the red stripe means. Please read it as understanding the fundamentals alleviates confusion. I figured it out. Sorry for adding any noise to this thread. does anybody know what is the part number for the 10 pin connector with digikey? i just can't figure how to find it on their site. First batch of Cwejman don't have protective circuits in according to Wowa. I fried the second channel of my D-LFO which is serial number 004 by plugging it red stripe up, but the cable was oriented to be red stripe down. Always triple check!!!! Luckily, I was able to send it back to Cwejman to get it repaired for free, great customer service. The power connector issue is a bit of a nuisance and need never have happened if Doepfer had been sensible when they started. They, unfortunately like many companies that have followed, did not enforce proper control of the manufacturing of their power cables and along with the use of open headers on both their modules and busboards leads to potential problems every time. I always use boxed headers which automatically polarises the socket and forces the power connector to go in the `correctÃ¢â‚¬â„¢ way each time. HOWEVER,, if you are using power cables from other suppliers, there is still the risk of there being a wiring problem. There are 2 factors for considering the suitability of a cable. MECHANICALLY Ã¢â‚¬â€œ pin 1 of one connector goes to pin 1 of the other connector. If a cable meets both these criteria then it should be insertable in any Doepfer compatible system without problems and following the Doepfer guideline of `stripe downÃ¢â‚¬â„¢ i.e. pin 1 of module connector goes to pin 1 of busboard connector which are both at the bottom when viewed normally. With Panther modules you have no option at the module end because being polarised, pin 1 is always at the bottom and the cable can go in only one way. Using Panther cables ensures that you will have no problem and pin 1 WILL be the stripe and WILL b -12V. Some cables are MECHANICALLY correct but TECHNICALLY incorrect. In this case the pin 1 of one connector goes to pin 1 of the other connector. However, pin 1 of the wire (stripe) is NOT connected to pin 1 of the connector. This is not a problem with open headers as you simply follow the `stripe downÃ¢â‚¬â„¢ rule and you will be assured of a good connection. Using these cables with my panther modules will cause a slight problem as the stripe will be in the UP position due to the polarising feature of the connector and thus the `stripe downÃ¢â‚¬â„¢ rule cannot be applied and you would need to plug this cable in to the busboard with the stripe up. In the worst case scenario a cable maybe TECHNICALLY and MECHANICALLY wrong i.e. no only does pin 1 of the cable not go to pin 1 of the connector but the stripe at one end goes to pin 1 while t the other end it goes to pin 16 Ã¢â‚¬â€œ i.e. a twisted cable. This can be made to work on systems with open headers but the stripe down rule goes out the door. As you can see, there are a multitude of cable permutations with varying degrees of compatibility. With systems using open headers the emphasis is on checking the cable arrangement. On systems using boxed headers you need to do some extra checking. The first 2 cable arrangements are easy to check. Hold each end of the cable and feel for the polarising bump on one of the longer faces of each connector. If they are both on the same side (i.e. both on the left or both on the right) then the cable is a straight-thru cable and can be freely used in systems with open headers following the stripe down rule. Putting all this to one side. If a module has the -12V pins marked and the busboards are also similarly marked then it is simply a matter of plugging the cable in at the module end, noting which edge of the cable is at the bottom (nearest the -12V pin) and follow that edge to the busboard end making sure that when plugged here it also has the same edge nearest the -12V pin. If you follow this rule then you wonÃ¢â‚¬â„¢t go wrong no matter what cable permutation you have nor whether a module has open or boxed headers. NOTE: if a busboard has boxed headers (like mine do) then you MUST check the cables fully because you will not have any flexibility here and the cable must be TECHNICALLY and MECHANICALLY correct. how is one to know where the -12 is on the headers on the modules pcb when there are absolutely no markings on the pcb to signify (or any info on "da "internet" ? are keyed bus boards(in my case: uZeus flying but boards) only meant to work with certain euro modules ? So, maybe i missed the disclaimer then ? It's not that hard. The "info on da internet" is in the first post of this thread. Look at the picture. That shows you the connector layout as seen from the component side of the board. Anyone know how to connect the Doepfer 5V Adapter to a regular Doepfer Bus Board? Any Pictures or videos of this? just plug it into an unused connector on the busboard - turn the power off first obviously. the 5v led should light up on the busboard when you power on again.